Here's yet another FCC related news, but important nonetheless. After approving the Motorola Q, FCC finally decided to approve the highly anticipated Sidekick III, which will hopefully make its debut this Summer. In the FCC photo, we can see Sharp as being the actual manufacturer of the phone, which will feature a 1.3 megapixel camera and Bluetooth. That's about all we know, officially. 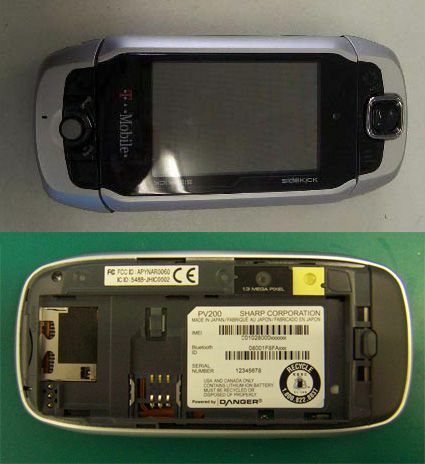 Unofficially, rumors are saying that the Sidekick III will also contain an SD card slot. According to MobileTracker, Sharp filed for 45 days of confidentiality, meaning that no other information will be available until approximately June 2006. Stay tuned. I from Asia country but u realy realy realy want a sidekick!